NYC Smile Design - BLOG - ORAL CANCER: Have you had your screening? Everyone i s susceptible to oral cancer. According to the American Cancer Association, 35,000 people are diagnosed with oral cancer each year. 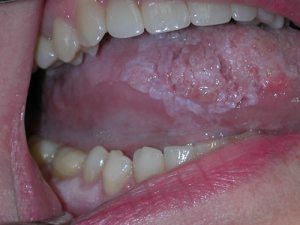 While it is not highly recognized as a serious type of cancer, oral cancer accounts for a large percentage of all cancers in the United States. And although tobacco and alcohol users count for an approximate 80% of those with oral cancer, studies show that oral cancer is also on the rise among young adults who are non-smokers. According to the CDC, other causes like viral infections, poor nutrition, exposure to ultraviolet light (especially from the sun) and certain occupational sources can also be factors in causing oral cancer. - Unexplained bleeding in the mouth. - Unexplained numbness or loss of feeling in any area of your face, mouth, or neck. - A soreness or feeling that something is caught in the back of the throat. However, as mentioned before, it is difficult to detect the early signs of oral cancer. As with many cancers, early detection of oral cancer is key to a good prognosis: it can lead to a five-year survival rate of more than 90 percent. If you notice any of the symptoms we've described, be sure to schedule an appointment with your dentist so you can be professionally examined. Better still; have your mouth checked on a regular basis, since early detection is your best protection against the disease.